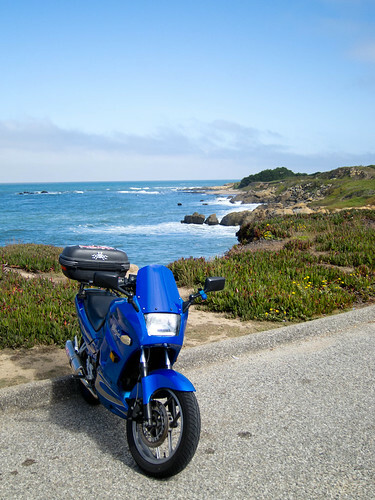 For the past few months, I’ve wanted to ride to AÃ±o Nuevo. Â I’ve been once before, on the XT back in April 2009, and really loved it, so it’s been a little goal of mine. Â After the SMCNHA ride, I felt like AÃ±o was within the realm of possibility, so when last week Sunday dawned warm and sunny, I decided to just go for it. As a matter of idle curiosity, the Lemos Farm horse was actively being painted as I rode by! I couldn’t get a photo this time, but since the blank white horse triggered philosophical upset, I spent a few miles trying to come up with a metaphor for watching the horse being painted. Â This was unsuccessful. My first stop was at Pebble Beach, site of the SMCNHA walk. Â I needed to take a stretching break anyway, so I walked the trail a little and admired the flowers. 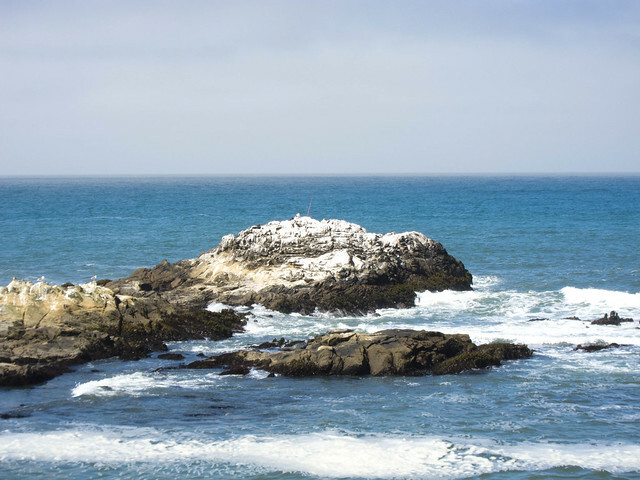 There was a guy out fishing on Bird Rock, wtf! Â I have no idea how he got out there and even less idea how he was planning on getting back. Â You can see him in the photo below as the little white hat at the very peak of the rock. I never have pictures of me on my rides, so I used the magic of the self-timer this time around. Â Hey look, it’s me! 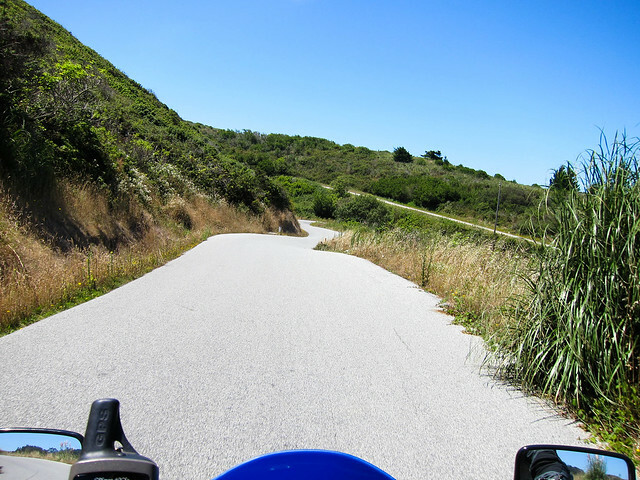 Last time I rode to Bean Hollow, I took (and posted) a bunch of photos of the plants but very few of the actual trail. Â It’s really a gorgeous trail and all of you should go walk it and enjoy the scenery. Â See? 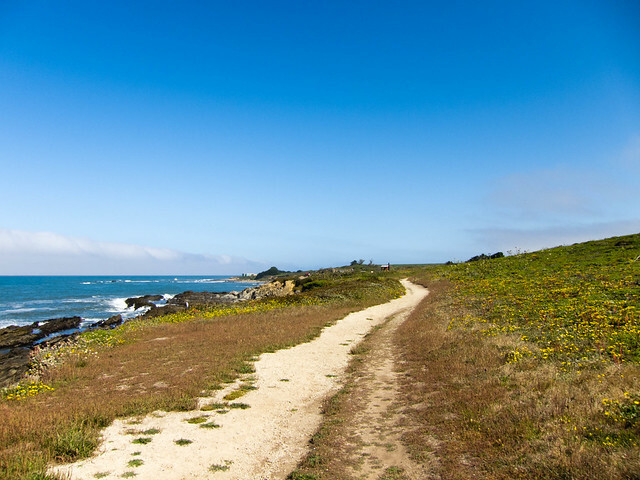 After my short hike at Bean Hollow Trail, I hopped back on the bike and headed south. Â This was now the farthest south that I’d ridden in two years! 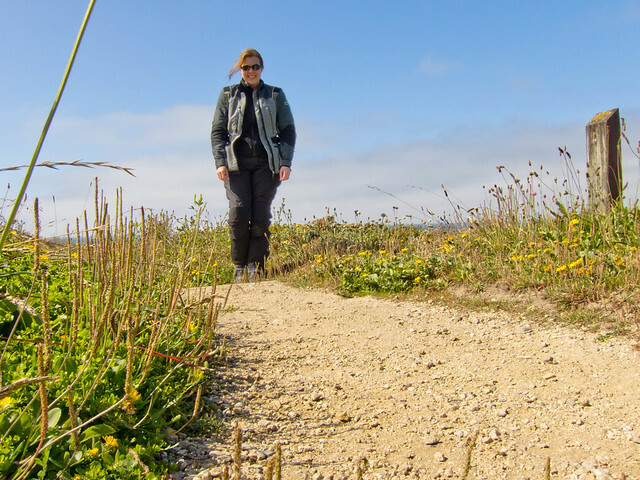 My original plan was to head straight to AÃ±o Nuevo, but I was starting to feel tweaky in the back…not nerve pain, really, but some muscle spasms. 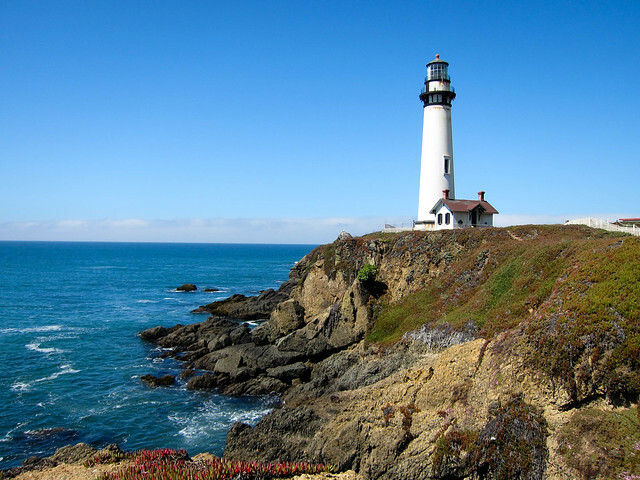 Â So when the Pigeon Point lighthouse showed up on the horizon, I thought, hey, a photo AND stretching opportunity! 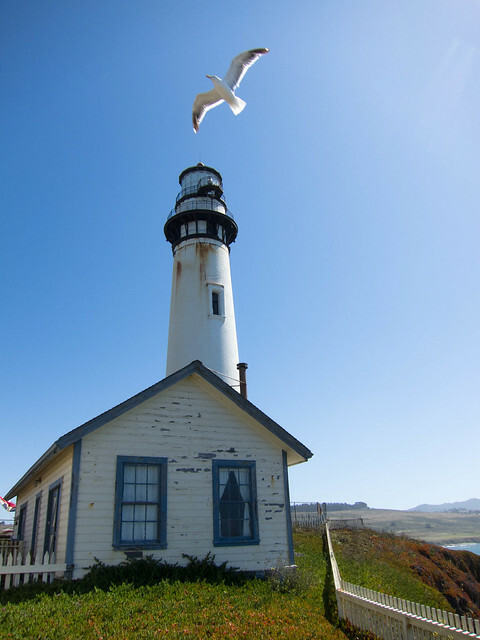 Last time I was at Pigeon Point, the buildings were closed. Â This time they were open, so I got to wander through the little exhibit of photographs of Pigeon Point and environs. Â Some were pretty cool! Â I also wandered through the little gift shop/information buildings, and was impressed. Â There was a little video playing, but I didn’t stay to watch it. Duly stretched, it was time to continue south. 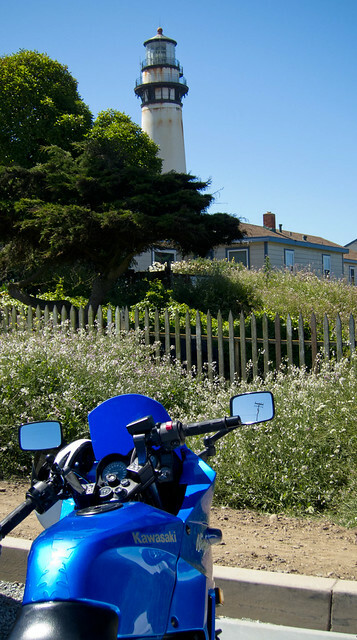 Â I contemplated ending my ride at Pigeon Point and turning around for home, but AÃ±o Nuevo is only 7 miles farther south and I’m a stubborn git about things like that. Â So continue on I did. 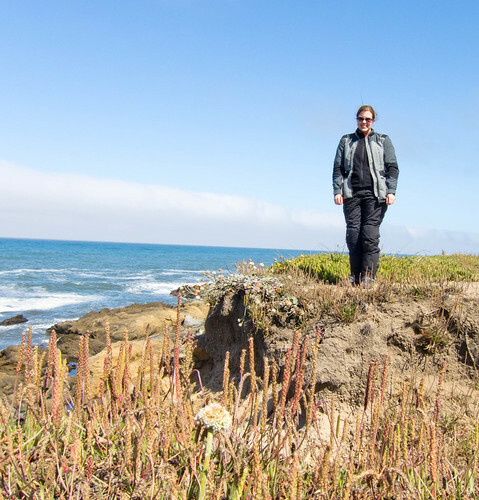 I parked at AÃ±o Nuevo ($10 parking fee; naturally my California Parks membership card with its free parking pass arrived in the mail two days later), locked the gear to the bike, and headed out onto the trail. Mid-August is molting season for the adult males, meaning there was much less activity at the beach than when I was last there in the springtime. Â The ranger on duty told me that January is the time to go to really see activity; the crappier the weather, the better. Â Note that you have to be on a guided tour to visit the seals this time of year, and apparently it’s best to call ahead for reservations. 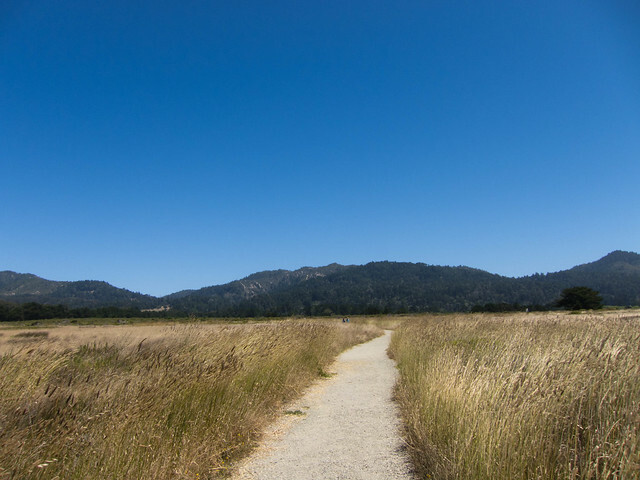 Anyway, my tour was all self-guided, and I had the trail pretty much to myself. Â The lush green scenery that I remembered from my April visit was replaced with dusty summer reeds. 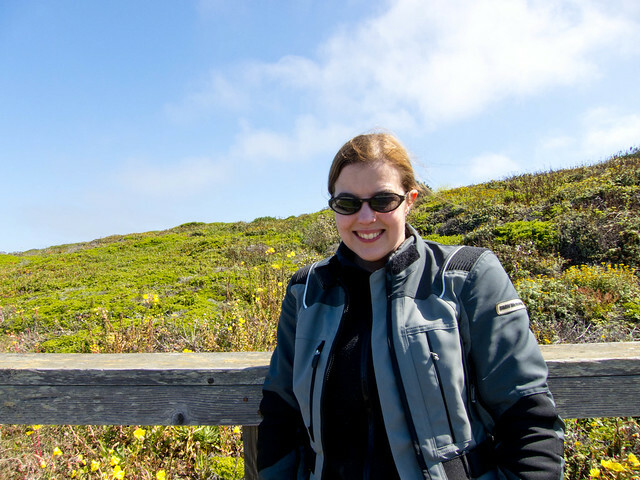 Â Fortunately we’ve been having a cool summer and the 1.6-mile hike to the beach wasn’t hot, even with motorcycle boots and a long sleeved T-shirt. 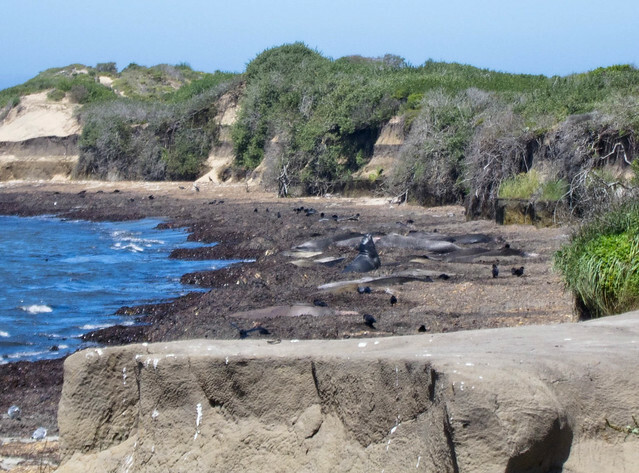 A little less than a mile from the beach is a visitor’s kiosk with some information about sea lions and elephant seals. 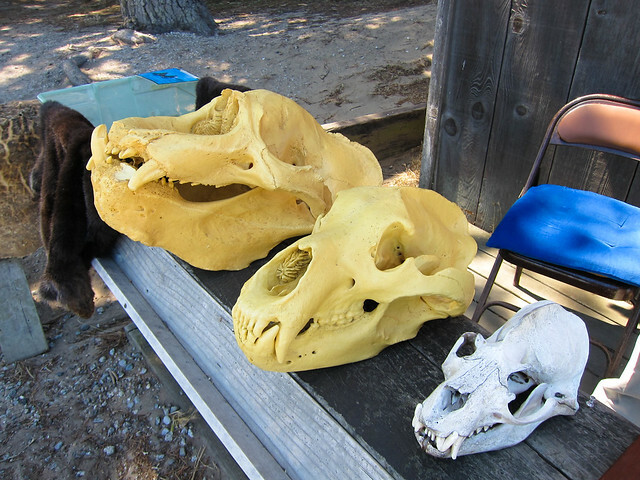 Â The docent explained these skulls to me: Â from left to right, it’s a replica of a male elephant seal skull, a replica of a grizzly bear skull, and a seal skull. Just past the kiosk is this dire warning. The warning wasn’t necessary for me as there were only about 25 males out on the beach, all much farther than 25 feet away. Â Kind of annoyingly so. Â Curse you, nature, for being inconvenient to photograph! 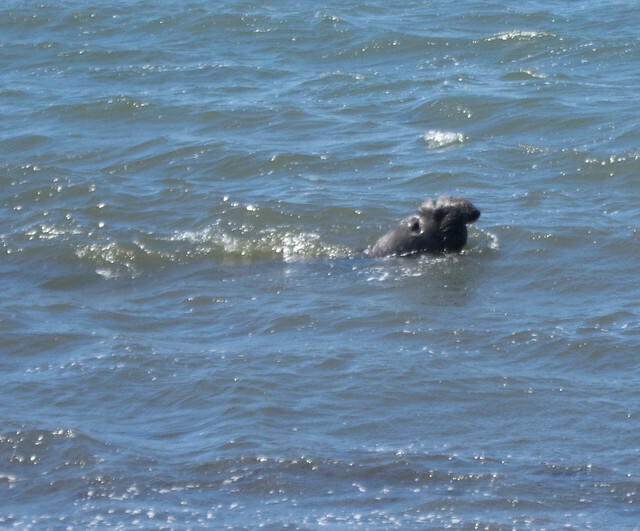 One guy did swim in to the beach while I was watching, though, which made up for the other males being so far away. 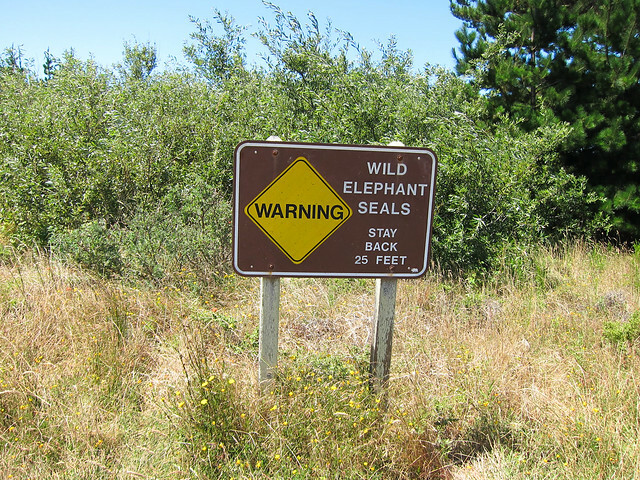 I didn’t stay at the beach very long as I was starting to get hungry and there wasn’t a lot of of elephant seal activity going on. Â I plodded along back to the parking lot, making one more short stop at the kiosk where the docent thankfully had a band-aid for a newly formed blister. Â The Daytona boots are awesome but a 3-mile hike up sand dunes can still be rough on the footsies. 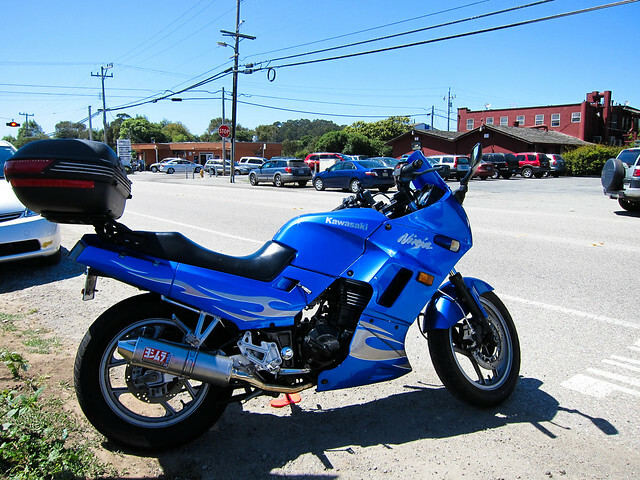 I rode up north to Pescadero and had another bowl of awesome half-and-half soup at Duarte’s. 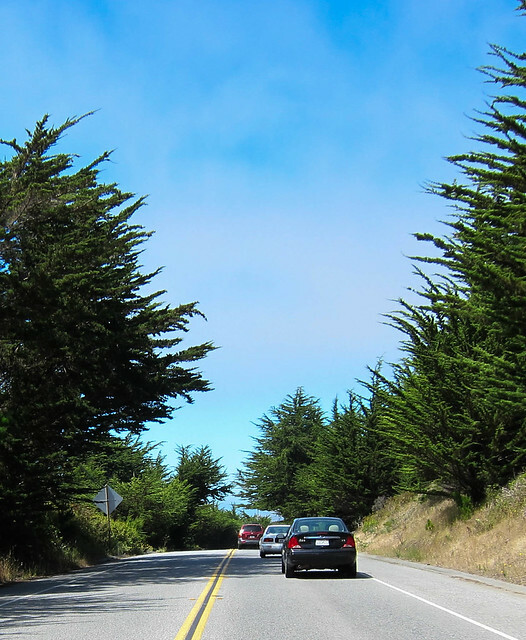 The ride up Highway 1 back to Half Moon Bay was gorgeous. Â Too bad “gorgeous” means “touristy drivers” and they were out in force. Â I call this next photo “Going 40mph on Highway 1 means I’m bored and will take photos of your slow driving”. All in all it was a very fun ride and definitely the longest one I’ve taken since getting hurt. Â I wound up being a bit sore over the week; probably about the same amount of soreness that I reported after my last 75-mile ride. Â The discomfort is really just muscular but includes a relentless urge to shove something pointy into my quadratus lumborum muscle (hence acupuncture). 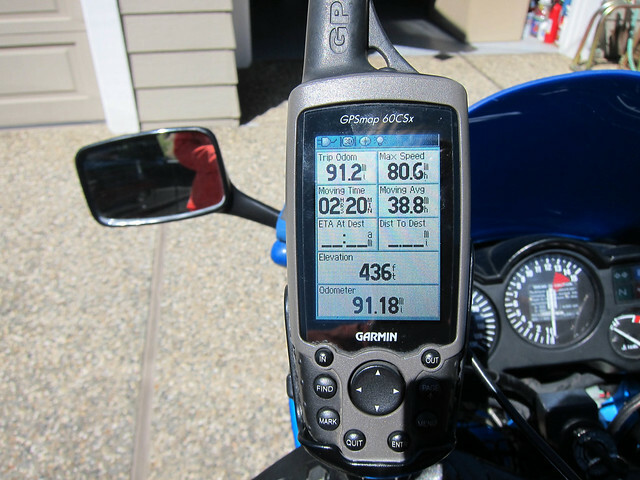 This entry was posted in Ninja 250, Rides. Bookmark the permalink. One Response to AÃ±o Nuevo achievement: unlocked!